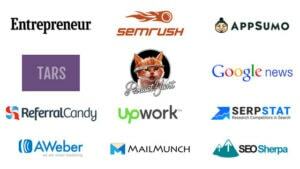 Reviews and case studies of some of the most popular blogging and inbound marketing tools and services. Find the best blogging tools and resources for your needs. Email marketing is no monkey business. Or is it? Founded in 2001 by Ben Chestnut and Dan Kurzius, MailChimp with its loveable banana-loving mascot has quickly become one of the most widely-used email marketing services across the world. Give a quick Google search on the terms 'Best SEO Tools' and you are bound to get articles featuring one or all of these tools - SEMrush, Ahrefs, Moz Pro, and SpyFu. In this article, we'll put each of these tools under the microscope and help you decide whether it's worth investing in them. In this Instapage review, we will take a closer look at the tool's features, pricing, and even guide you in creating your first landing page with Instapage. To create visuals that leave a lasting impact, you need a tool that allows you to easily design visual content assets such as infographics, presentations, and social graphics. One such tool is Visme which is quickly gaining popularity among marketers. Learn more about the key features of Visme in this in-depth review. SendPulse seamlessly combines simplicity with complexity to offer an email marketing product that can give veterans such as Mailchimp, AWeber, and GetResponse a run for their money. It seeks to bring unique features and an easy learning curve to the email service provider (ESP) market, making it an ideal option for beginners. AWeber and Mailchimp are two of the most popular and reliable email marketing tools on the market and in this article, we will compare these two ESPs to help you decide which tool is a better fit for your requirements. UTM.io allows you to build, share, and sync UTMs with your team so that you can have cleaner data, resulting in better campaign results. Watch this video review of UTM.io to learn more about how UTM.io can help you maximize ROI of your marketing campaigns. Snovio is an incredibly useful tool for lead generation and email outreach. It significantly reduces the time it takes to find relevant leads and streamlines the entire outreach process. Learn more about this tool in this in-depth review. Hi there, I’m Sandeep Mallya! 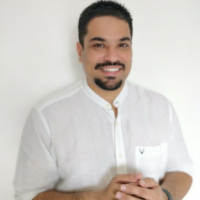 I’m an entrepreneur and digital marketing consultant from Bangalore, India. I founded my own digital agency, Startup Cafe Digital, in 2015 where I help SMBs leverage social media, SEO, and content marketing to grow their traffic and generate qualified leads for their business. I started 99signals in 2016 as a side project to document all the strategies, tools, and tactics that I was using to grow my small agency. The goal was simple: to arm other solopreneurs with all the right information they needed to launch a successful business. Top AppSumo Deals: What’s Coming to AppSumo in April 2019 — Updated! 25 Best Marketing Subreddits (That You Should Join Today) — Updated! Some of the links on this website are “affiliate links.” This means if you click on the link and purchase the product/service, we will receive an affiliate commission. No article published on this site should be republished anywhere (the web or otherwise) without written permission from the owner. 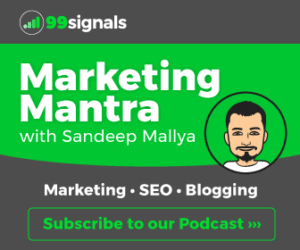 99signals is a marketing blog run by me, Sandeep Mallya, to help bloggers and entrepreneurs run a successful side business and earn extra income through blogging and affiliate marketing. © 2016-19 99signals. All rights reserved.